Pro-anorexic websites which persuade young women to starve themselves could face punishment under new French proposals. The French National Assembly will next week discuss bringing in a law to offer jail sentences of up to three years and €45,000 (£35,700) fines to anyone encouraging others to slim to the point of death. It comes after the campaign headed by anorexic French model Isabelle Caro who appeared in a controversial advertisement showing her skeletal frame during Milan fashion week last. There has been a huge backlash across Europe against pro-anorexic websites. Now Valerie Boyer, a French politician, has brought a motion to drive the sites out of action and deter others from setting them up. It is hoped the law would deter fashion houses from using very thin models to promote their clothes. Boyer proposes jail sentences of up to two years and £23,800 fines for anyone who persuades a person to lose weight excessively enough to "compromise their health". In extreme cases, where the sites can be shown to have led to the actual death of an anorexic the punishment would increase to up to three years' jail and £35,700. 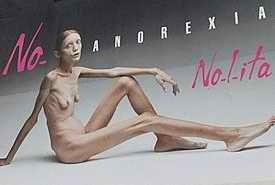 Boyer said anorexia was being promoted by magazines, internet sites and blogs. Judicial and penal sanctions were the only way to fight these abuses, she said. Gerard Apfeldorfer, a French psychiatrist, said: There is a difference between incentive to 'go on a diet' and to encourage anorexia. Anorexia is a mental illness, often caused by imitation. But I am not sure the best way to prevent the disease is to put pressure on the advertising and fashion magazines. But he hoped it would persuade current sites to operate within the new law. Internet sites and blogs which assert an anorexic lifestyle to teenage girls were outlawed by the French parliament yesterday. The law is the first attempt anywhere in the world to stamp out the "pro-ana" movement, a cult-like attempt to promote anorexia as a lifestyle which began in the United States eight years ago. If, as expected, the legislation is also approved by the Senate, it will become a criminal offence in France to encourage another person to seek excessive thinness... which could expose them to a risk of death or endanger their health. Offenders risk two years in prison or a €30,000 (£24,000) fine. Although the law would also apply to magazines, it is mostly aimed at internet sites and blogs which have sprung up in France in the past two years. These sites, which also exist in the UK, worship extremely thin female celebrities, including Nicole Richie and Victoria Beckham. The French Health Minister, Roselyne Bachelot, told parliament: Giving young girls advice about how to lie to their doctors, telling them what kinds of food are easiest to vomit, encouraging them to torture themselves whenever they take any kind of food is not part of liberty of expression. The messages sent out here are messages of death. A typical French blog, Be Perfect, Be Pro Ana, carries a long letter signed your future best friend Ana . It encourages teenage girls to refuse food, to make themselves sick and to take laxatives in order to match the body shape of their "thinspirations" such as Richie and Beckham. The law's author, the centre-right deputy Valerie Boyer, says that between 30,000 and 40,000 people in France have anorexia. She says this kills more people in France each year than any other mental disorder. A federal Labor MP has called on the Australian Government to follow France's lead and ban pro-anorexia websites. Anna Burke said she had been calling for ban on anorexia websites for some time: It's something we really need to explore. This is dangerous information on the internet. The Government is developing a cyber-safety policy that includes internet service provider filtering for all Australian homes, schools and public computers, but there is no indication that pro-anorexia sites would be included in the "black list" created by the Australian Communications and Media Authority. Nicola Roxon, the federal Minister for Health and Ageing, said the Government would consider whether any action regarding the sites was appropriate. But Bruce Billson, the Opposition spokesman for broadband, communications and the digital economy, said it would be difficult to regulate and it was the parents' responsibility: Parents should maintain an active interest in the use of the internet by members of their family . France's National Assembly on Friday voted to ban the use of very slim catwalk models, in one of the latest measures aimed at trying to make fat people feel better about being fat. The ban was proposed as an amendment to Health Minister Marisol Touraine's health reform package by Socialist MP and neurologist Olivier Veran. Touraine herself backed the proposal that would stop model agencies being able to employ models whose Body Mass Index (BMI) falls below an as yet unspecified level. Agencies found employing models considered too thin could be liable for a fine of up to 75,000 euros ($85,000) and six months in prison. The lower house of parliament also backed a law making a retouched photo tag compulsory when people's bodies in commercial images are Photoshopped. No doubt such tags will become as omnipresent as 'beware this product may contain nuts' tags are in the food industry. As if ANY commercial image isn't photoshopped! The politically correct aim, the Socialist deputies sponsoring the measures said, is to bring body ideals hawked to the public back to a healthy reality. The penalty for breaking the proposed law could run to a fine of either 37,500 euros or 30% of the budget behind the offending advertising campaign. Even more reason to affix the warning to all images, just in case. French lawmakers approved another amendment proposed by Veran that would punish people inciting others to extreme thinness to a year in prison and a fine of 10,000 euros. That law was aimed at so-called pro-ana websites that some accuse of encouraging anorexia.